The beginning of the 20th century saw the coal and iron industries in the Welsh valleys reach a peak of production, then enter a slow but accelerating decline and finally close down in the 1960s. During this period valley towns, of which Risca is typical, experienced a radical change in their way of life. As in the rest of Britain the changes were initiated and sustained by advances in science, technology, education and communications. They were compounded in the valleys, however, by the contraction of the two basic industries that gave most employment to the great majority of the men. Each village was a tightly-knit community. Living in terraces in relatively small communities brought the people into close contact with each other. As the author writes, a symbiotic relationship existed between the workplace, the chapel, local politics and sport. 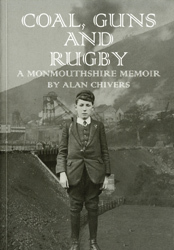 Percy Chivers, the subject of this book, was to represent both Risca and Cross Keys rugby teams. Mutual help societies gave financial assistance in times of unemployment as well as for medical care and funeral expenses. All these institutions and activities reflected the inter-dependence of the men in the mines as far as mutual safety, help and support were concerned. The First World War took many men away, and their experiences in the conflict greatly affected their viewpoints and attitudes when they returned. This book offers snapshots from the life of a person who lived through these momentous years, as recounted through the eyes of his son. It provides glimpses of a way of life which, together, contribute to a fuller picture of a period so unlike our own. It reveals the accommodation of Percy Chivers to the harshness of the conditions under which the miners were forced to live and work. At the same time, it shows that, through the harshness, there was a will to service and a capacity to serve, manifested in a community spirit and a sense of belonging. As well as offering details of the history of the mines, Mr. Chivers provides vignettes of social life, including his father’s time he served in the Home Guard. This will remind older readers of a time past, and provide a few surprises for younger readers.